A group of nearly 100 senior cadets gathered at the Military Museums in Calgary to remember the Battle of Vimy Ridge in 1917. 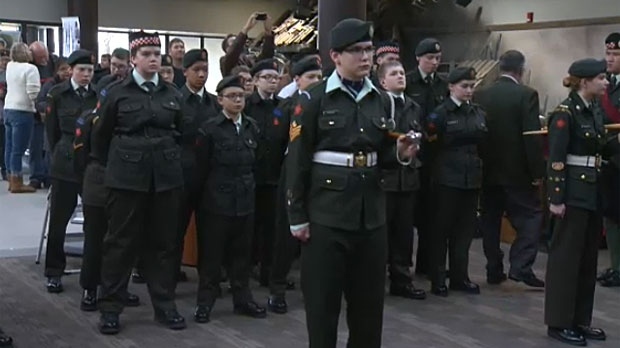 Members of Calgary’s army cadets took part in a special ceremony on Saturday remembering one of Canada’s most recognizable military operations during World War I. Over 100 senior members of the corps participated in the event to mark the anniversary of the Battle of Vimy Ridge, which began on April 9, 1917. Jordie Aldred, warrant officer with the Calgary Highlanders, says that his participation in the Vimy memorial is a ‘wow’ moment. He says the world has changed so much since the time of Vimy Ridge. The fighting lasted three days and Canada suffered over 10,000 casualties by the end of the battle. Four members of the Canadian Forces received the Victoria Cross, the highest military honour bestowed on soldiers in the Commonwealth. More than the military victory itself, the event helped lead Canada to be recognized as an independent nation from Great Britain and helped contribute to a newfound sense of pride and national unity.